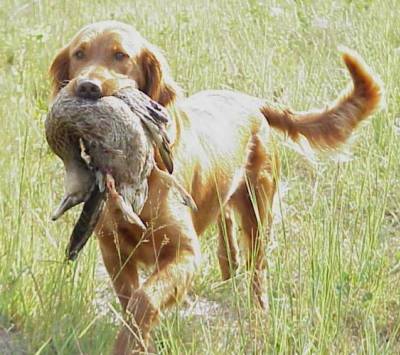 A Photo Gallery of the Retriever Training Forum Dogs and the people they own. 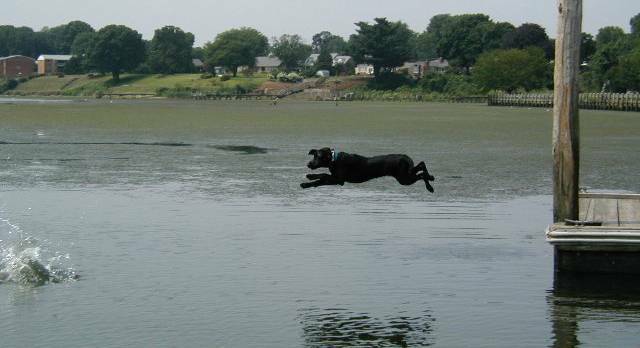 Ken Mackenzie sends us these pictures of Jessie, his black lab pup. 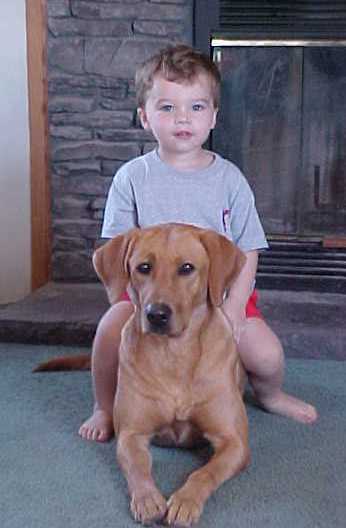 Mary from upstate NY is pictured here with her pup "Bails". 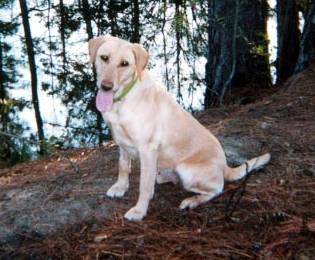 Bails earned her NAHRA started and AKC Junior titles in four entries each. This team is definitely "hooked" on the dawg games. Doc E's Casey went 4 for 4 in his Licensed Field Test debut, earning his NAHRA SR title with ease. Casey's now chugging along with his Intermediate work. 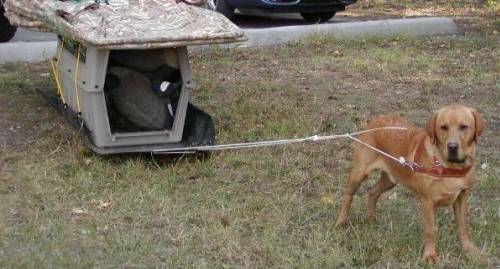 On the right, Casey shows how he helps the boss get his hunting gear to the blind! 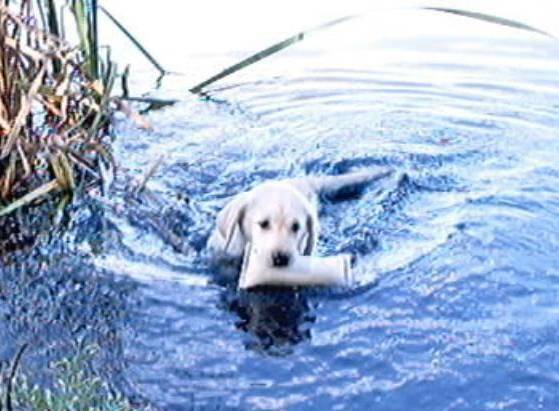 Who says a retriever's work starts AFTER he's in the blind? 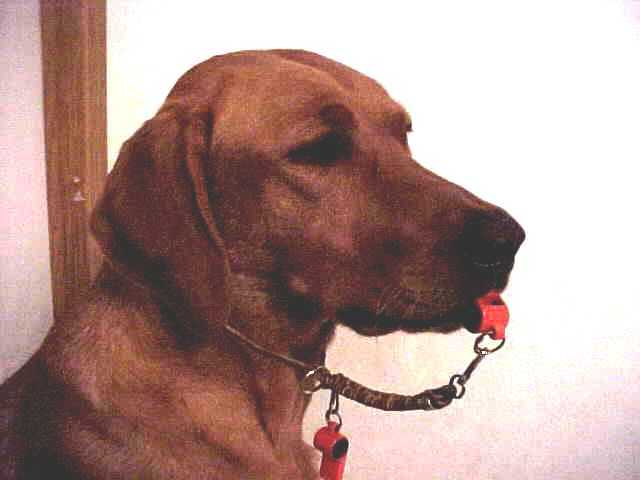 Thomas Peña of Albuquerque, NM has trained his lab, Reina Loba to assist in wildflower picking. 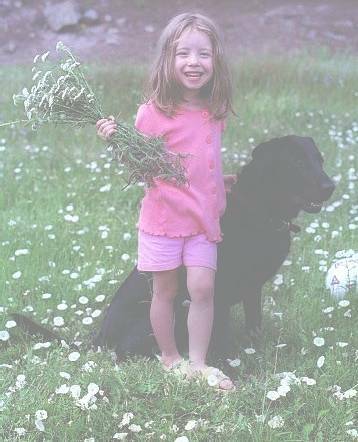 Here Thomas' daughter Mariana is shown after picking session in a meadow area of the Jemez Mountains. 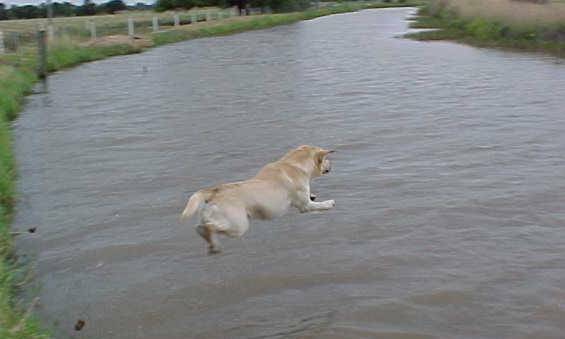 On the right, Reina Loba runs a long blind along the Cebolla creek. 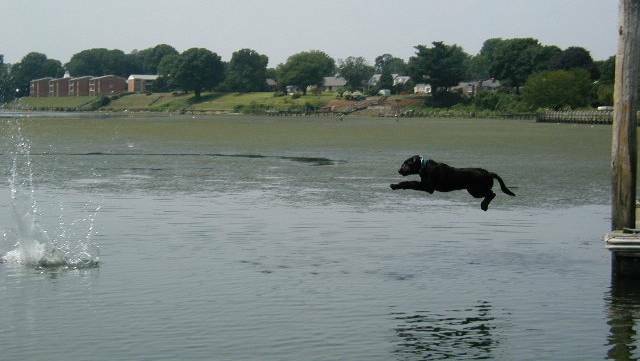 Bill Beckett of Ireland sends these two pictures of his young gundogs, a spaniel and a lab. 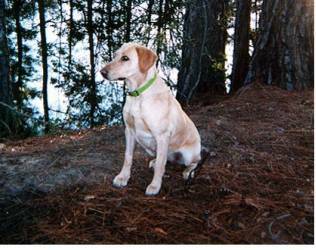 Captain Jeff Coats, hunting guide on the famed Chesapeake Bay in Marylad, took these photos of his new guide service partner "Coot". She's pictured here on her 6 month birthday this past Summer. Most likely her water entry this season will be stylish! 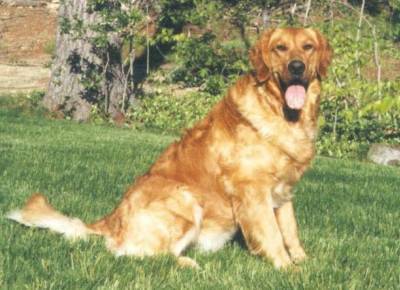 Bill Steglitz, aka "Stegs" of Massachusetts owns Cooper pictured above. Rob Heilig of SC with a browndawg. Rob points out the importance of the training aid in his right hand. 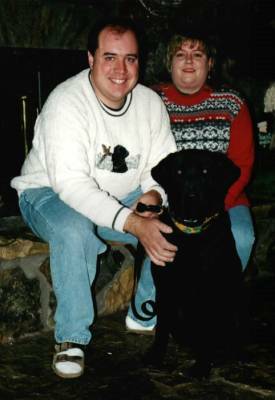 Darren and Pam Wallace and their dawg Lucy who's always improving in her dawg work! 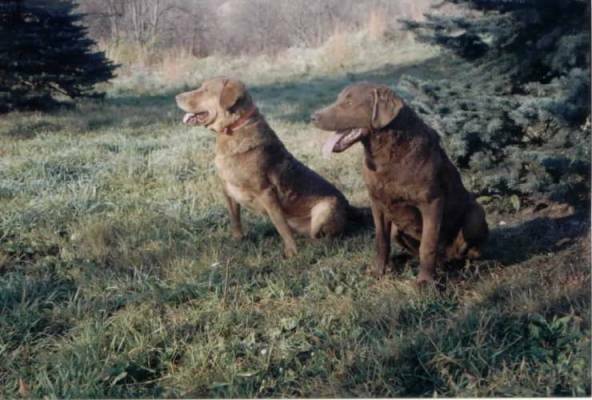 Cray and Michelle Stephenson of Creighton Kennels in Big Spring, Kentucky own these dawgs. On the left is Hannah, center pics are Laurie. 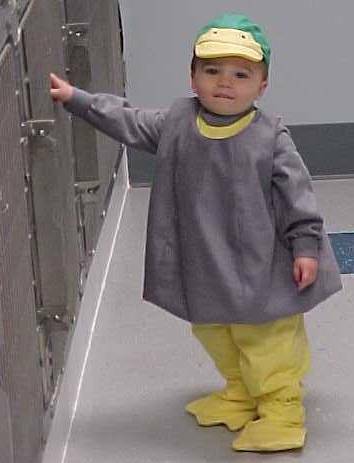 Patrick is testing out his mom's handmade drake mallard Halloween outfit and then, a later pic of Patch with his pal Laurie. 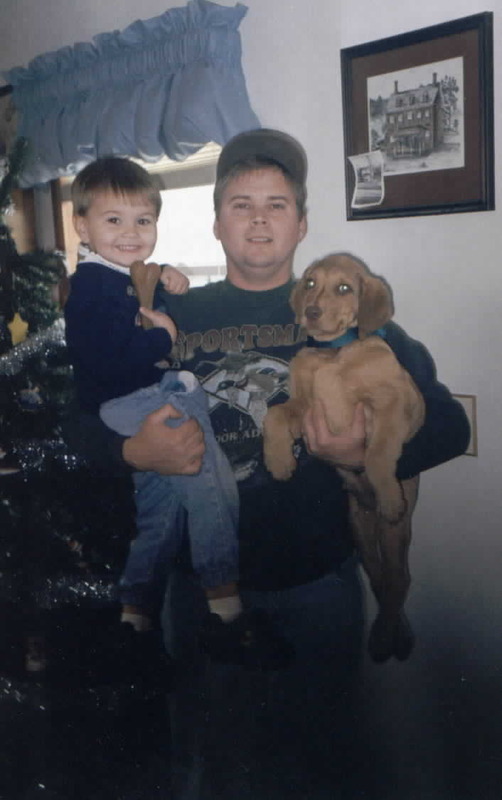 Finally, a pic of Daddy Cray with puppy Tuck. 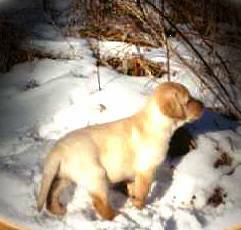 Lee Salmon bred this little puppy, shown at 5 1/2 weeks with his first bird retrieve. This puppy is now owned by Mike Mills. 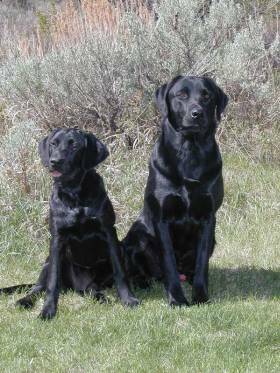 These two dawgs are owned by Steve and Karen Shaver of Utah. 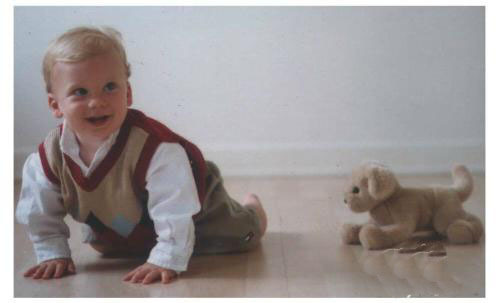 Abbee is the little goober on the left, age 4 months in this pic. On the right is Larry (aka..the Wonderdawg)! As you can see, Larry has Steve trained well. 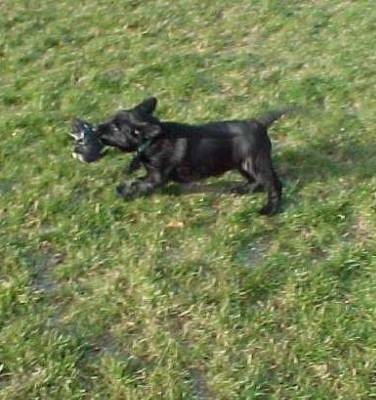 "Kwik Taffey" is retrieving a bumper at 10 weeks of age. Kwik is owned by Jim Boyer of Roscoe, IL. Kwik and Jim expect to have a great first season together with the Badger State HRC. 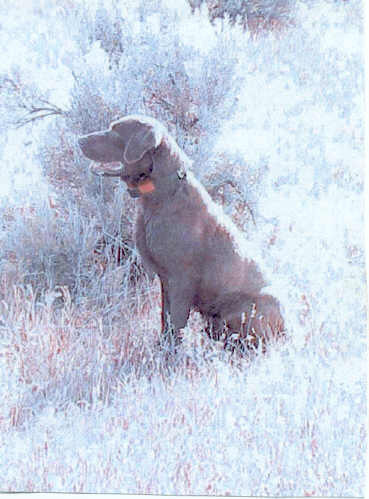 "Thunder" aka "Blunder" is owned by Tom Lewis at Elite Gundogs in Ogden, UT. 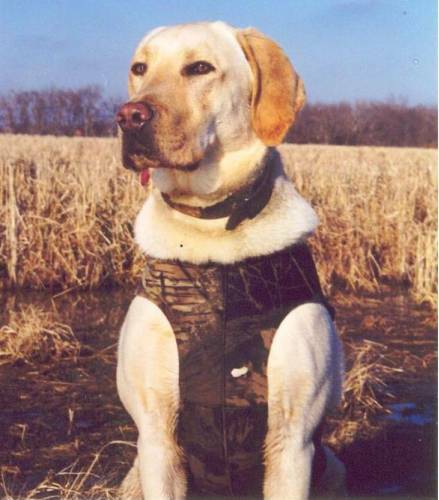 Elite's Sepia Thunder works as a guide dog for 6 months out of each year and currently has over 3,000 hunting retrieves to his credit! 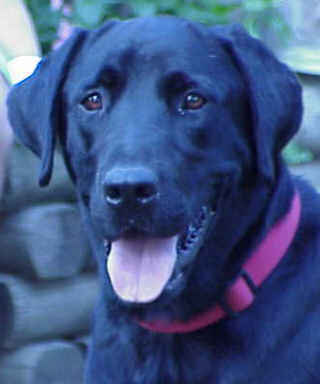 Junior shown here "belongs" to Dr. Rick and Nicole Fanella of Indiana, PA. The shot on the right shows Junior working geese at 16 months of age! 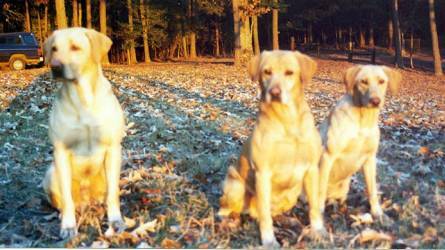 These yellows were in from a recent litter bred by Jerry Harris of Texas. The caption that Jerry sent was "Don't worry little brother, I know of an Amish home for you." 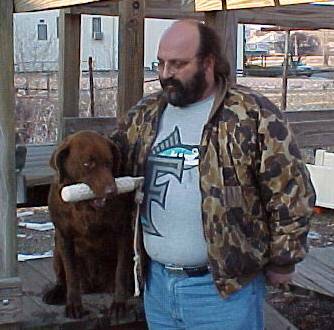 One of these or a littermate to these may be now owned by e-collar guru Fred Hassen in Nevada. 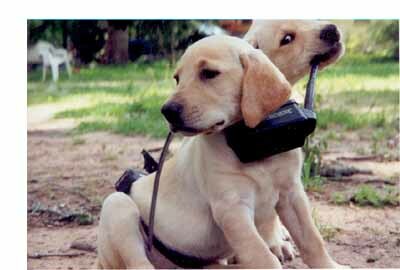 Eli (front) and Gracie (behind) are owned by Harry and Karen Harper of the Dallas, TX area. On the right is a shot of Harry and Gracie in a Texas tank gettin' after 'em! 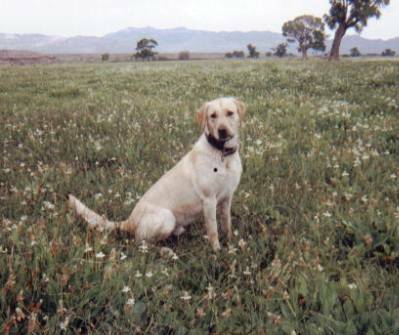 Cappy is pictured here in his first Spring surrounded by Nevada spring wildflowers in what is now one of his favorite training fields. Jim and Carol Belmont of Las Vegas are the proud owners. 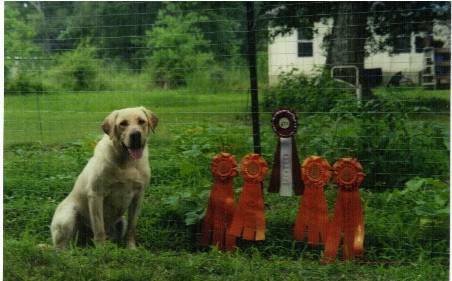 Here's Mic and his owner/trainer/handler Peggy Ramsey in a dove field on the left and the team proudly displaying a 3rd place Qualifying Ribbon on the right. Moira Atkinson with Maili and Bubba after a successful NAHRA test day. The Atkinson pack (center pic) Maili, Luke, Bubba and Champ. Right hand picture..the whole crew on wedding day. 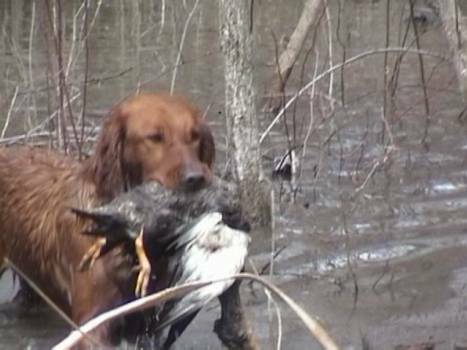 Jeremy Chinn, a waterfowler, competition duck caller, and maker of Lagrue Custom Calls duck calls, sends this picture of his dawg Jesse. 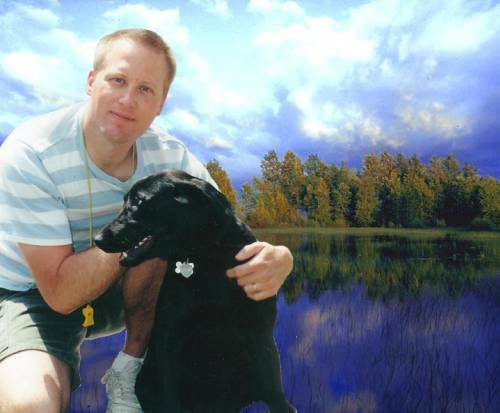 Dave Bray's kennel Kinkade Chesapeakes is featured here. 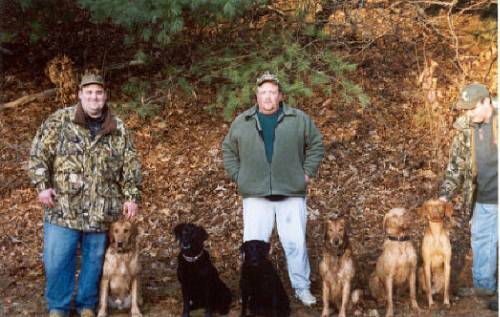 On the left is father Buck owned by Dave (aka Peake) and next to him is Brock, owned by Dr. Rick Fanella. 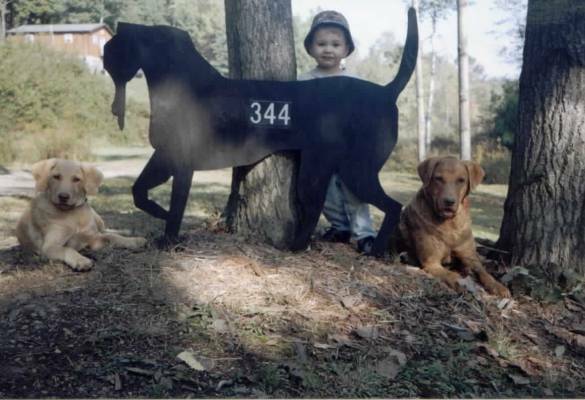 The center pics are shots of Joey with HR Buck and puppy Katie. 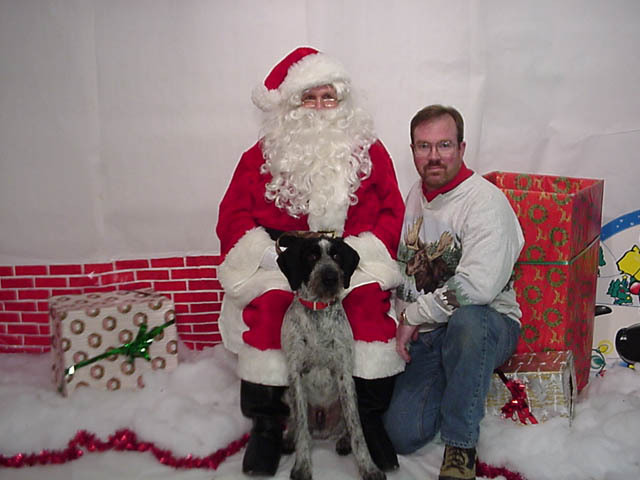 On the right is a pic of Dave with son Joey and the famous RTF Christmas pup. 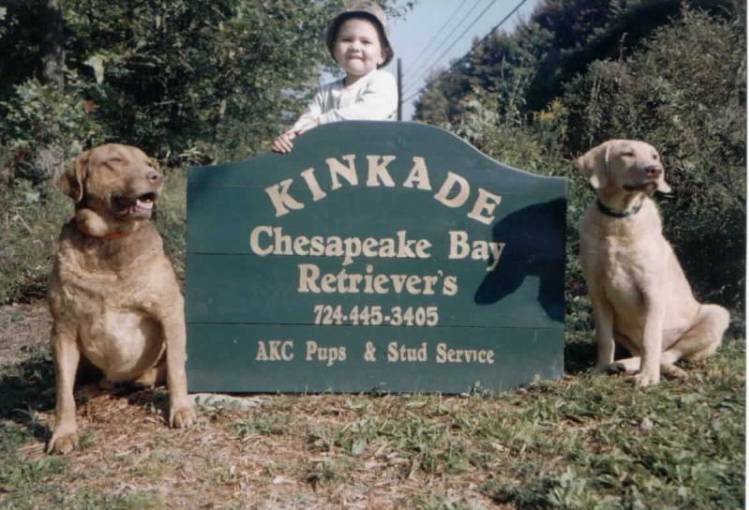 This pup was part of a collaborative effort by Cray Stevenson and Dave Bray to get this Kinkade kennels donated puppy to a young boy whose father had passed. 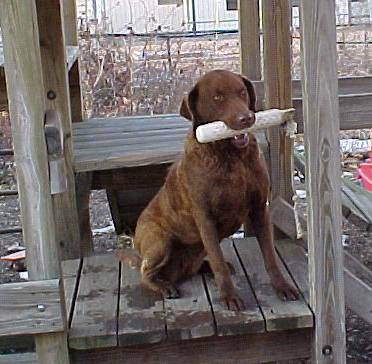 All this boy wanted for Christmas was a Chessie pup...and he got one! 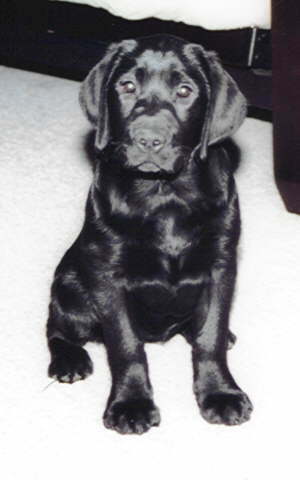 Hunter is pictured here at around 8 weeks of age. 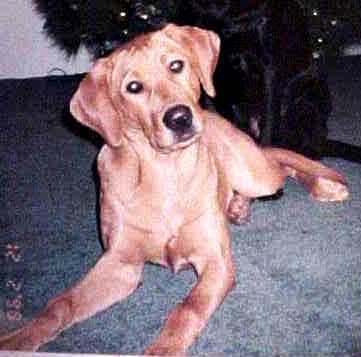 He is owned by Eric Austin of Columbus, Ohio. These guys are looking forward to a fun Spring and Summer, with dreams of Fall outings for wildfowl in the future. Henrietta Knight, the daughter of Kevin D. Knight poses here after a victorious day with "Smoke". "I handled him, but Henrietta looks much better in the pictures!" says Dad. 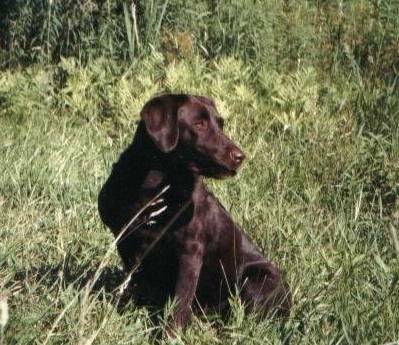 This placement was won in a Fort Detroit German Wirehair Pointer Spring Field Trial held on April 7 2001. 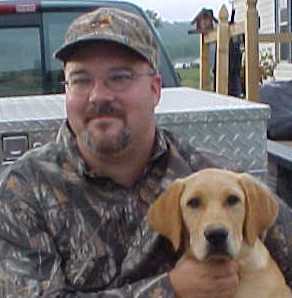 Donny and Lisa Morgan of upstate NY operate HighHopes Retrievers. Of their most recent litter, photo below left, there are still a couple black pups who are getting daily training and are available to the right home. 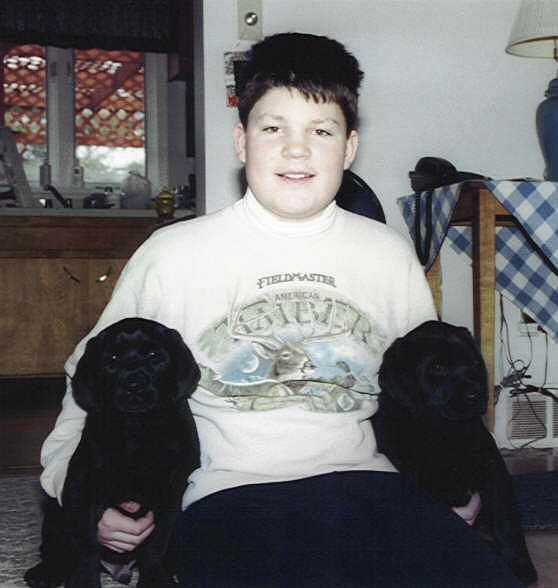 Paulie, Morgan is shown (middle) with old dawg Zack. 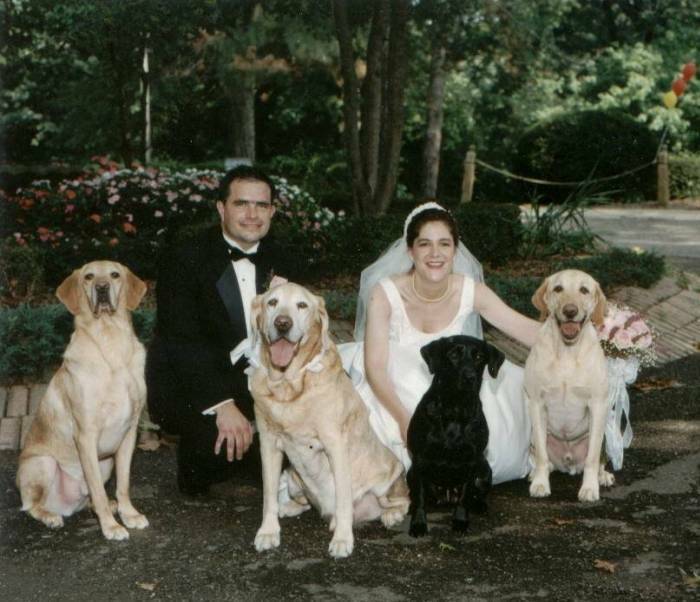 Donny Jr. oldest son is in the next shot with the two available pups. 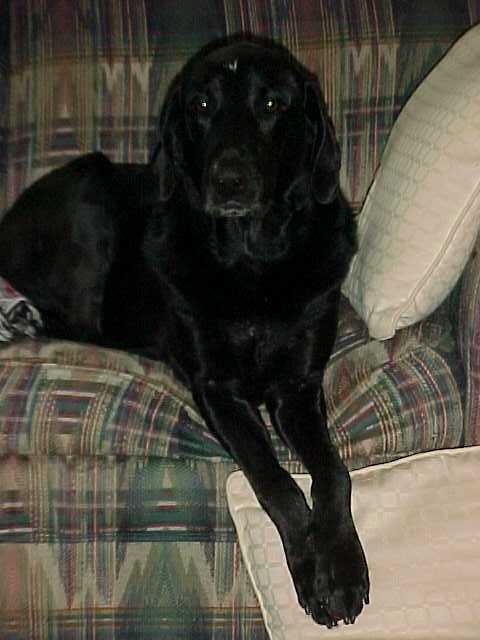 Sadie is owned by Keith Black. 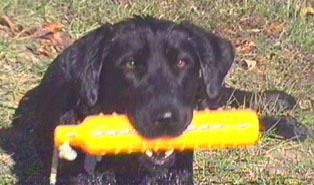 She and Keith are serious waterfowlers from Peru, Indiana. 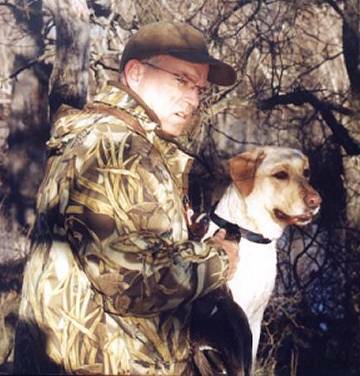 Doc is remembered by Brian Cockfield of South Carolina. 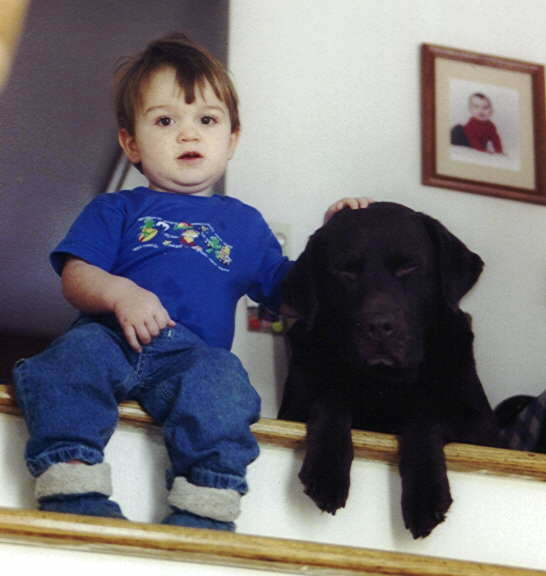 Buckwheat's Little Root Doctor MH was born April 22, 1995 and died October 30, 2001. 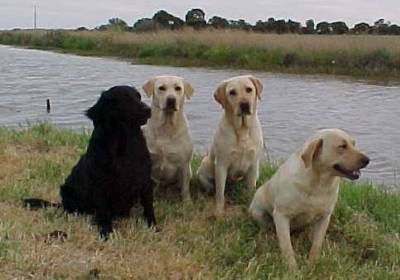 The pic on the right shows Doc with some of her other best training pals from left to right are "Yetti", "Threat MH", and "Doc MH". 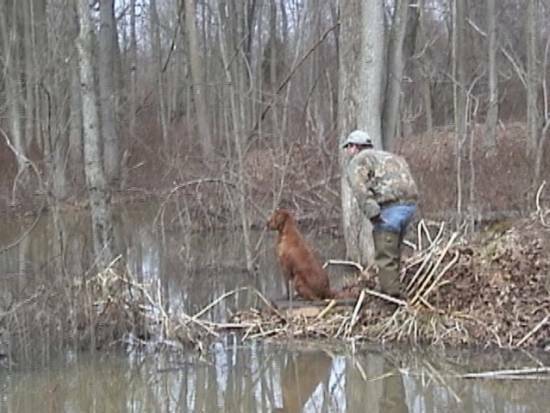 Doc was truly Brian's best buddy and will always be remembered as his #1 gundog and companion. Waynep of Australia sends these pics of his pack. 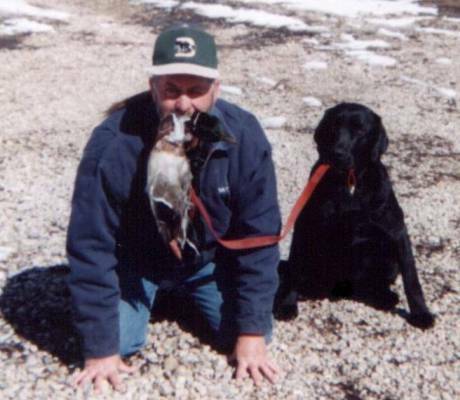 The black one is a Flat-coated-Retriever, his duck dog, at 9 years old. She ran in about 10 trials and won an all-age at her 7th trial way back in 96. was leading a state champ at her 10th trial until she wrong birded on the second last run. The judge (an old friend) had great delight in telling me that. hyped up, mad as a snake, not consistant enough for trials or fun to train but we have fun on the swamps. the channel is 28 paces from the back door of the house. 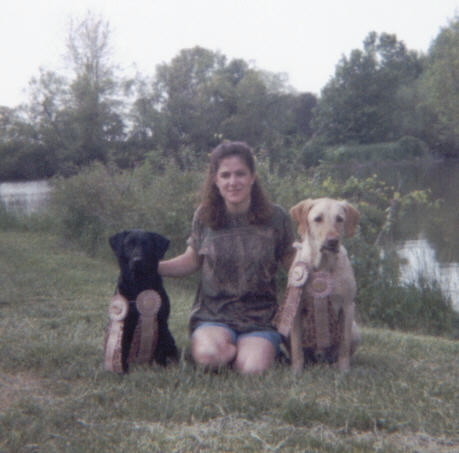 Mark Mulhollem and Casey are shown here at the Northern Piedmont NAHRA Regional Spring 2001 (left and center). 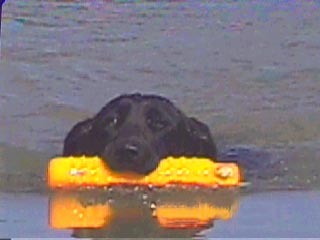 Right, Casey retrieves a Suzie in a NAHRA test. DavidJ and Comet win the Amateur! 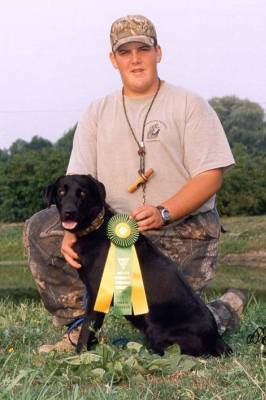 Breeze Hill's Burnin' Comet (FC/AFC Rebel Ridge Cody's Mischief x Budd's Ocean Spray Girl - 6/30/98) wins the Amateur at the Spring 2001 Talbot Field Trial. 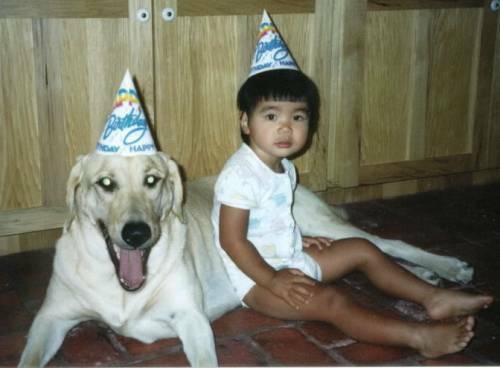 Comet is owned, trained and handled by David Jensen of Maidens, VA.
Lily and Hattie are shown here celebrating Lily's 2nd birthday, first thing in the morning. The two, both ''owned'' by John Hewitt (aka Hew), are the same age and are not unlike Siamese twins. 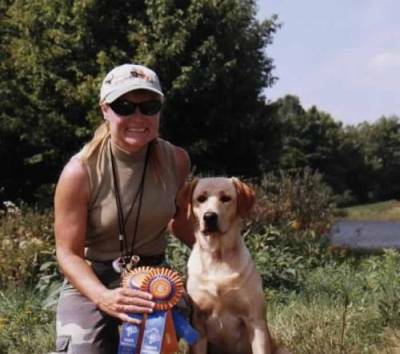 Joey O with Diesel, pictured here after their first AKC Junior qualification at beautiful Lake Champlain Retriever Club (Vermont). Joey acknowledges pro Alec Sparks for his training with Joey and Diesel. Kurt Williams' labs "Sam" (yellow) and "Ty" (black) are shown in their boss' duckboat getting ready for their upcoming MO waterfowl season. 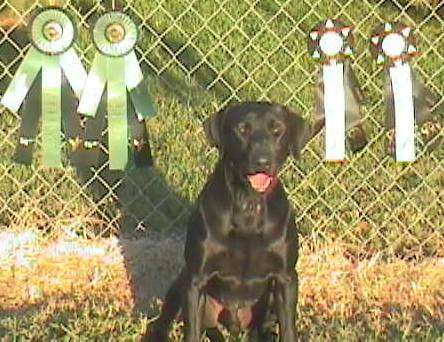 On the right is Ty with this season's resulting ribbons from a 4 - for - 4 UKC/HRC hunt showing. 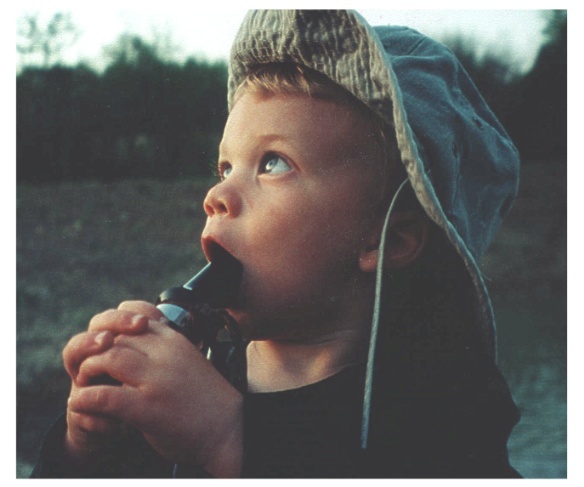 Jerry Harris of Texas sends this pic of young "Termite". 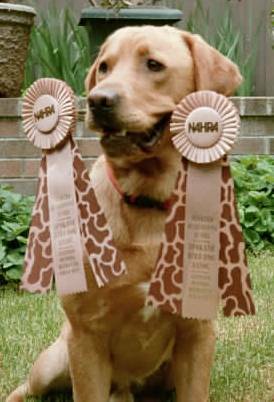 This pup went 4 for 4 in AKC Junior and Jerry expects more success with the big dawgs. 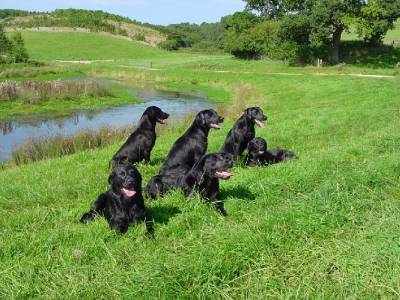 Sue-UK sends this gorgeous picture of hers and her friend Carole's UK labs in the rolling hills of the Somerset, England countryside. Shane Doughty with Storm pose with their day's take after a Grove City, PA event. 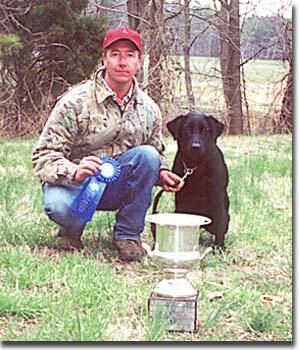 They got their WR title with the help of SWPA pro trainer Rich Kerlin. 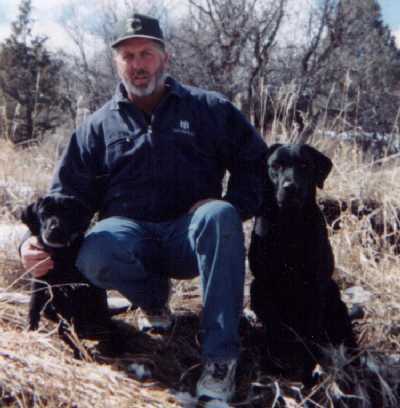 Ken MacKenzie is shown here with Hot Diggity IV "Jessie" (FC Watermark's Troublesome Scout x Ebony's Midnight Blue), BLF, whelped 07-01-00.